11 billion miles from home, Voyager 1 is on the verge of interstellar space. Launched in 1977, NASA's Voyager 1 spacecraft was charged with several space-tasks prior to leaving Earth. It was to pass by Jupiter and Saturn, for instance, and send back information on what it saw. It was to keep safe its golden record, an audiovisual introduction to humanity compiled under the guidance of Dr. Carl Sagan, unless it was able to pass the record to any friendly space aliens. Now, 33 years on, Voyager 1 has excelled at first two tasks; just as well, too, since it's about to leave the solar system. 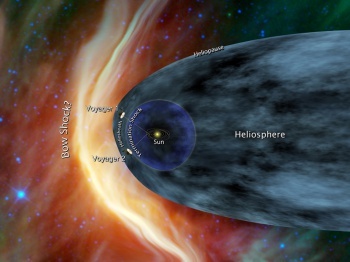 For the past few months Voyager 1 has been picking up far more charged particles than it has previously, leading researchers to conclude that the machine is moving through the heliosheath located at the edge of the heliosphere within which our solar system resides (see above). Once it passes this barrier, Voyager will officially achieve interstellar status. "The laws of physics say that someday Voyager will become the first human-made object to enter interstellar space, but we still do not know exactly when that someday will be," commented Ed Stone, Voyager Project scientist at the California Institute of Technology in Pasadena. "The latest data indicate that we are clearly in a new region where things are changing more quickly," Stone continued. "It is very exciting. We are approaching the solar system's frontier." How will we be able to know when Voyager 1 has cleared the heliosphere and properly escaped our system, then? Scientists have drummed up a few possible predictions of what life outside the heliosphere might be like to assist in deciding. The first indicator is the amount heliosphere-generated energized particles bumping against Voyager 1, a number which has been slowly dwindling over the last few months. However, scientists say that they expect to see a sudden, visible drop in the number of these particles once the craft is completely clear of the heliosphere. Another indicator of transition to interstellar space could be a shift in the magnetic fields surrounding Voyager 1. Scientists expect that clearing the solar boundary will mean that the fields shift from a regular east-west orientation to a more interstellar-esque north-south one once the craft breaks through. "When the Voyagers launched in 1977, the space age was all of 20 years old," added Stone. "Many of us on the team dreamed of reaching interstellar space, but we really had no way of knowing how long a journey it would be - or if these two vehicles that we invested so much time and energy in would operate long enough to reach it." According to NASA, some of Voyager 1's instrumentation could continue collecting and transmitting data for another 20 or 30 years (remote reprogramming is being used to strategically shut down systems and conserve energy). With that in mind, the optimists among us might start smiling at the thought of finding out what kind of information a truly interstellar Voyager might send home. The heliosheath isn't small by any means, and 20 years isn't that long in terms of space travel; but maybe, just maybe, Voyager will still be talking by the time it becomes the first human object to see the universe from beyond our solar system.